That same day, the New York Times was reporting on Democrats moving to support the protests as they spread across more cities. “Leading Democratic figures, including party fund-raisers and a top ally of President Obama, are embracing the spread of the anti-Wall Street protests in a clear sign that members of the Democratic establishment see the movement as a way to align disenchanted Americans with their party,” the story stated. 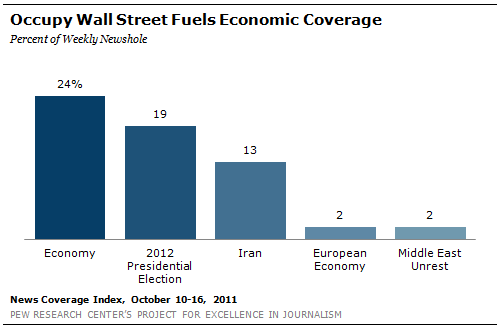 One day later, on its nightly newscast, NBC anchor Brian Williams declared that the “center of the [protest] message is increasingly resonating,” a statement followed by news of a new NBC/Wall Street Journal poll indicating that 37% of Americans now support the protests, including 40% of those making $75,000 or more a year. An old issue, Romney’s Mormon religion, also surfaced after Pastor Robert Jeffress, a Rick Perry supporter, called Mormonism “a cult.” Part of the media discussion focused not only on Romney, but on whether Perry needed to do more to distance himself from those remarks. And with recent problems in his campaign knocking Perry out of the top spot in polls, some coverage last week began exploring the idea that this was now Romney’s Republican nomination to lose. A story on the ABC News website led with the headline, “Is Mitt Romney Inevitable?” a theme that Romney aides were quick to quash. “Even the Romney camp itself is trying to temper the ‘sure thing’ label with a senior adviser telling ABC News the end is not near,” the story added. As he has risen in the polls, businessman Herman Cain also began to face some closer scrutiny of his record and ideas, much of the sort that Michelle Bachmann and Perry have experienced in this campaign. It was a sign of a familiar cycle—that as a candidate appears to become more viable, they get more media scrubbing. The coverage of the reported Iranian plot against the Saudi ambassador was the third-biggest story last week (13%), generating the most attention (20%) in the cable news sectors. Some of the coverage suggested that the U.S. resident implicated in the plot, Manssor Arbabsiar, was an unlikely and unqualified figure to be given a major role in such a complex and high-stakes plot. An October 12 profile of Arbabsiar on NPR’s All Things Considered offered this portrait from reporter Wade Goodwyn. 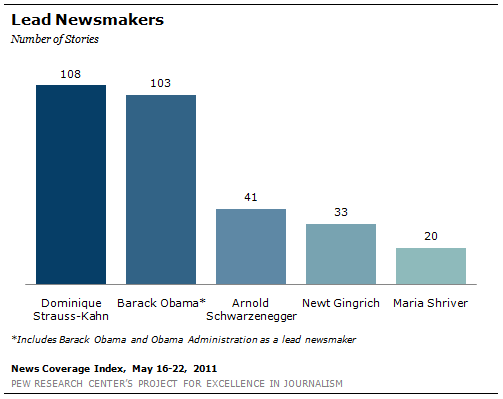 President Obama was the top newsmaker from last week. He was a primary newsmaker in 7% of the week’s stories, the same level of coverage as the previous two weeks. The next three most prominent newsmakers were men who hope to take his job next year. 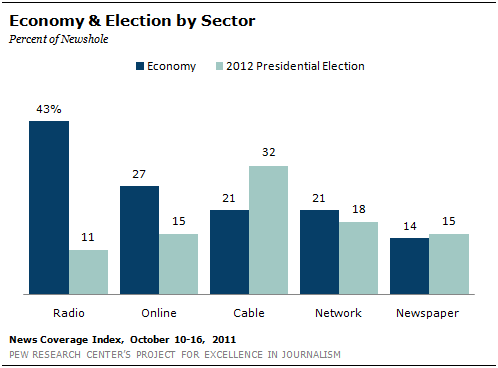 Mitt Romney figured prominently in 5% of the week’s stories, Herman Cain in 4% and Rick Perry in 3%. Rounding out the list of top newsmakers (also at 3%) was one of the key figures in the alleged Iranian plot that surfaced last week, Manssor Arbabsiar.